The holidays are almost over and a new year is beginning. 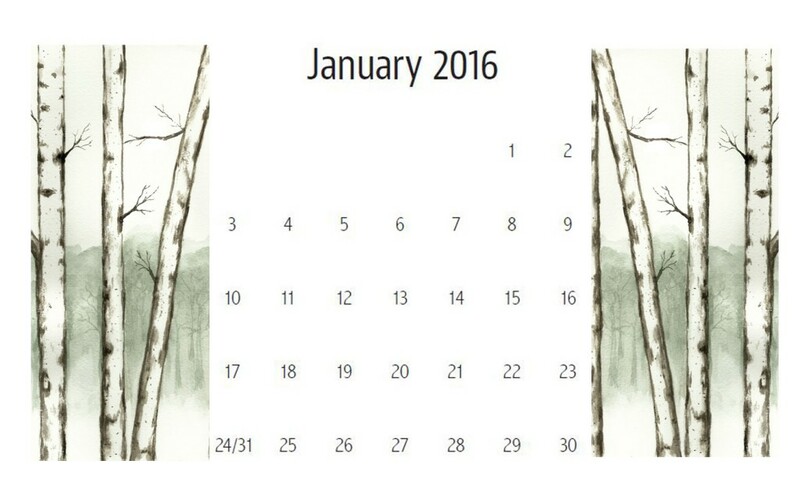 One of my goals for the new year is to paint a different calendar for each month. 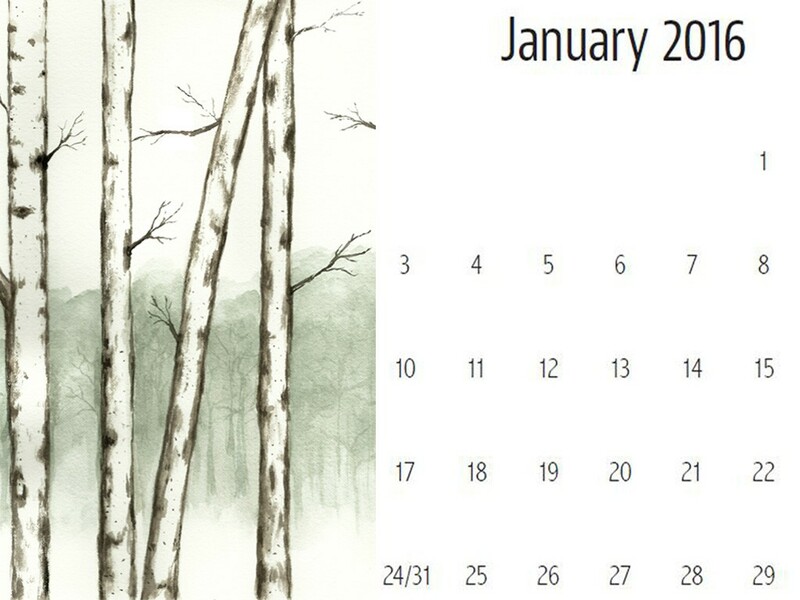 For January I painted this Free Birch Tree Watercolor Calendar. I’ll show you how to paint them next week – super simple – almost easier than the Faux Birch we did a while back. I have lots of goals for the New Year. Do you? Or do you make resolutions? I don’t make resolutions because . . . well, I already have way too many goals. And really . . . is there much of a difference between the two? Truth be told, I have goals every.single.day. I was just talking about this with my girlfriend today, telling her that my hubs used to say, “Just pick one thing, ONE THING, and do it!” Translation: follow thru to completion. Pfftt. That ain’t me. Oh sure, I do accomplish things but it’s the planning, the dreaming, the starting of a creation that I love. 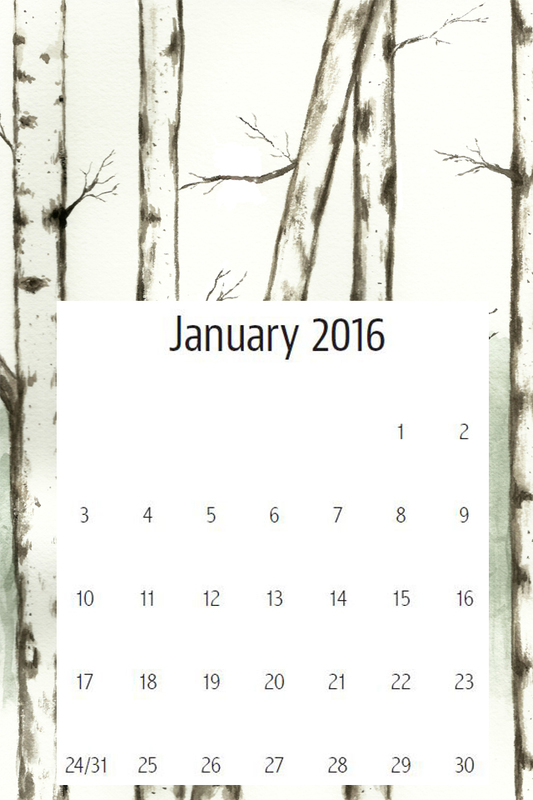 With the start of a New Year, it’s perfectly natural to make new goals – or assess present goals. I’m trying not to spend a lot of time on writing new goals. Two weeks after my mother passed in October 2014 I wrote an entirely new Business Plan full of goals and promises. Then about 2 weeks after that my entire world changed when Grief came for a long, long visit. Which meant, I accomplished very little of that Business Plan. A year has passed and I’m older and wiser. I’m wiser and realize that when you make a bunch of goals and don’t complete them, it doesn’t feel good. Also, along with being older I also need calendars and notepads more than I ever did. And the phone. Those dang ‘smart’ phones. Whoever named them that anyway? Nothing makes me feel as dumb as a smart phone. But still, I need it. I used to remember everyone’s number off the top of my head. Now if I can remember the first initial of their name it’s a banner day. And, yes, I use the calendar on my phone because it’s linked to my computer and all that great stuff. Except for one thing. The numbers on the screen have shrunk! 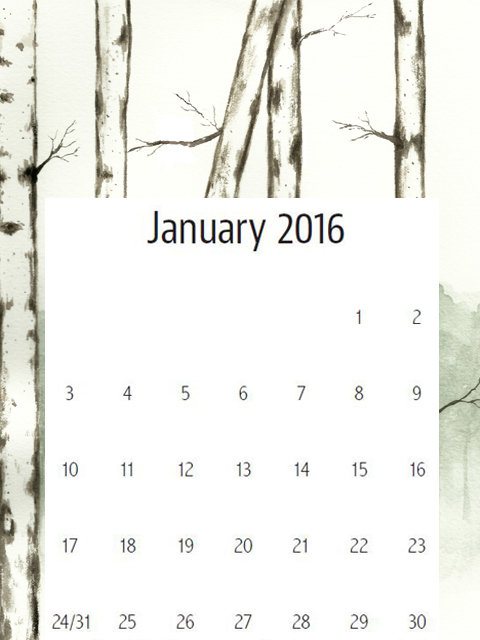 While I was painting the birch trees (tutorial to follow) I thought it’d be fun to add a calendar. 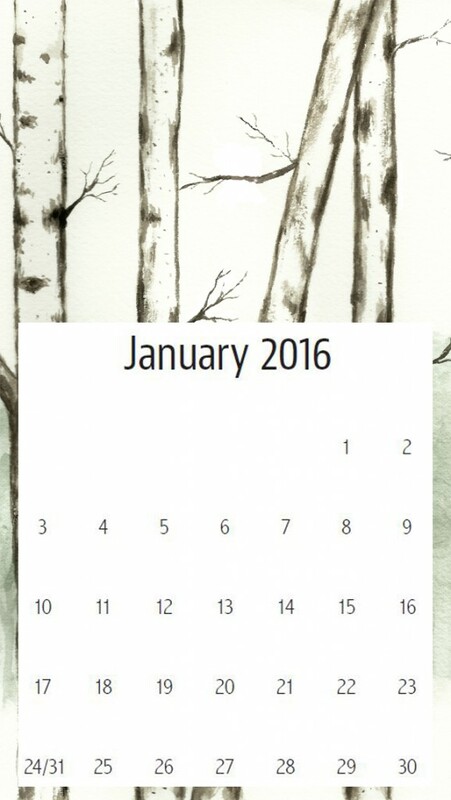 There are calendars for your computer desktops, large and smaller, an iPhone, an iPhone5 and an Android. I followed the dimensions that somebody on Google gave. Just right-click over the calendar you want and save to your computer. If that doesn’t work, let me know. Not that I’ll know what to do or anything but maybe between the two of us we can google together. All kidding aside, I hope you have a fabulous New Year and celebrate in whatever fashion brings you joy. 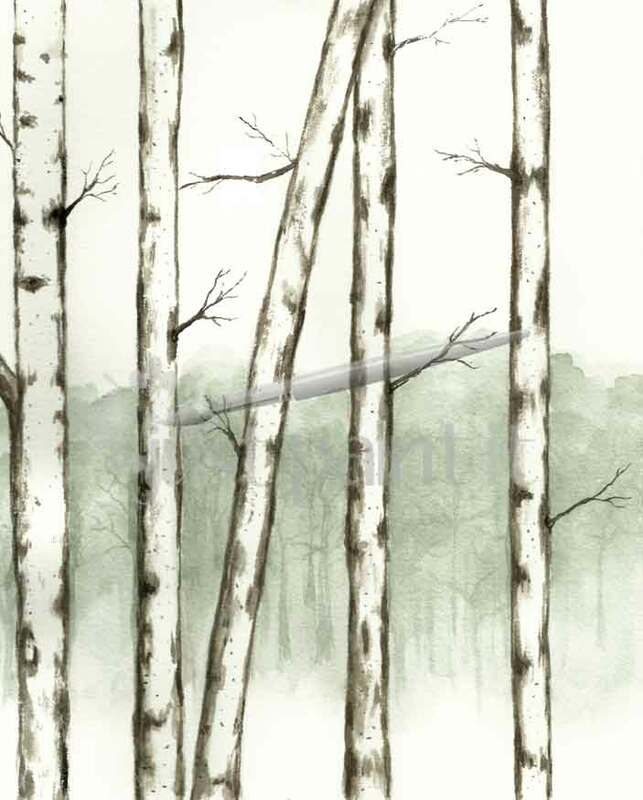 Take a few days to recuperate and then come back here for my first-ever tutorial for super simple watercolor birch trees. I do the same thing about starting a project & then take years to finish!! Thank you for all your fabulous paintings. I can’t paint or draw like you can. I just make my cards with stamps. I hope you have a healthy & happy New Year! !